Testing Adventure tourers usually has me prepare myself mentally for a machine that's a little laidback, but the BMW F 750 GS begged to differ. 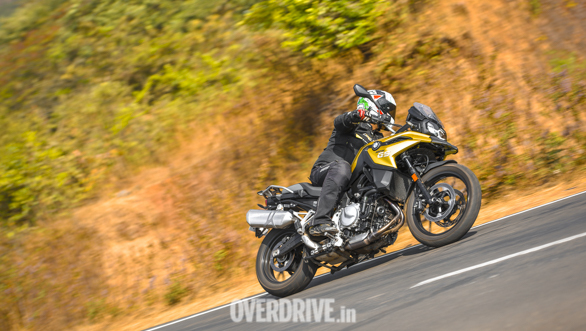 As I flitted through the chicanes leading up to Aamby Valley near Lonavala I was scratching my head saying, "Crikey, this is a little too restless to be a tourer!" The F 750 GS is the smaller of BMW Motorrad's two middleweight adventure tourers, the other being the F 850 GS. Both use the same powertrain but the 750 gets it in a lower state of tune and is more tarmac oriented. Of course, differences are significant enough for the 750 to warrant a different positioning. And why not  it uses a smaller, 19 inch front wheel and conventional forks upfront unlike the 850's 21 inch wheel and upside down forks. Yeah, what about the powertrain? The F 750 GS is powered by a new liquid-cooled, 853cc, parallel-twin engine that offers 77PS and 83Nm in this guise. Now, before you jump the gun and say, "doesn't the same engine offer 95PS on the 850?" 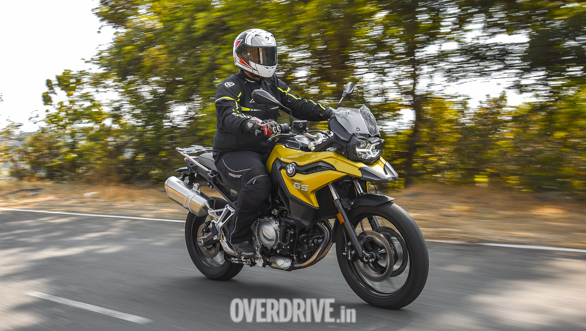 or, "doesn't the Triumph Tiger 800 offer 95PS in comparison?" let me tell you, it's the 750's power delivery that makes it so much fun. It's easy to compare numbers on paper and I'm not denying the power deficit, but I can confirm that the 750 has an uncharacteristic urgency and it will surprise you. In fact, throughout the near 500km I spent in the 750's saddle, I rarely remember having to open the throttle fully as there's enough and more shove at all times. 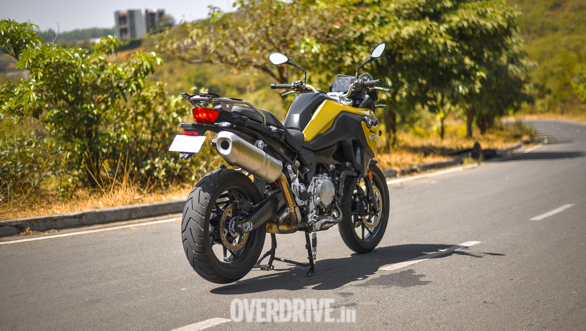 I took a few minutes to get used to the franticness first, as the engine helps you power ahead instantly, with help from the ride-by-wire's crispness and precise throttle responses. The motor's V-twin-like sound thanks to its 270 degree firing order is likeable too. Our test bike was the higher-specced Pro version that comes with additional goodies including a bi-directional quickshifter. The quickshifter works best only in maximum attack mode though which means it isn't exactly light at part throttle, and the clutch lever could have been lighter as well. These aren't exactly negatives though and are traits we see on high performance machines and if anything, they only tell you about the 750's intent. Our VBOX acceleration test surprised me too  a 0-100kmph time of 4.5 seconds is quick for a middleweight adventure tourer weighing 224kg wet! The quick-revving nature of the engine helps and even ensures in-gear acceleration is really quick. And not to forget  every time I pulled a wheelie, the rear wheel spun a little first and then hauled the front end up! 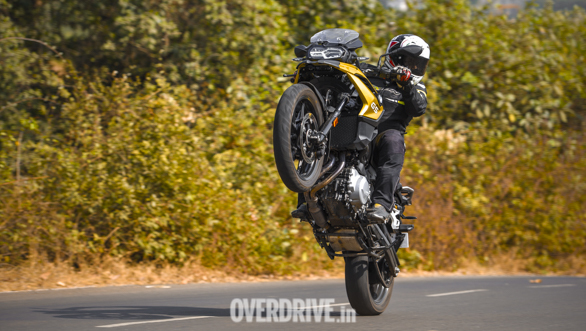 Should you fancy, the BMW F 750 GS is also a very able wheelie machine! Looks a bit quirky though? Yes. But BMW Motorrad has always chosen functionality over form, especially with its adventure tourers. 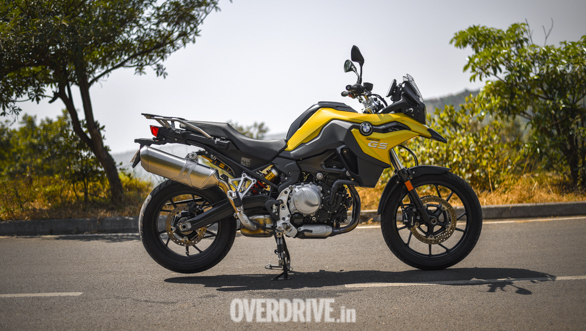 The F 750 GS thus has a quirky appeal and the 'Austin Yellow' shade of our test bike added to its appeal further. The short beak and unconventional face make for a striking appearance though the 750 looks more streetfighter than adventure tourer. It also gets a short windscreen which only deflects some amount of wind, but does go with the bike's aggressive face. And while the bike looks slim from most angles, its fairing looks wide from the saddle. The 41mm front forks look spindly but are par for the course. The engine sits tightly packaged underneath, though the upswept exhaust looks a little too large. 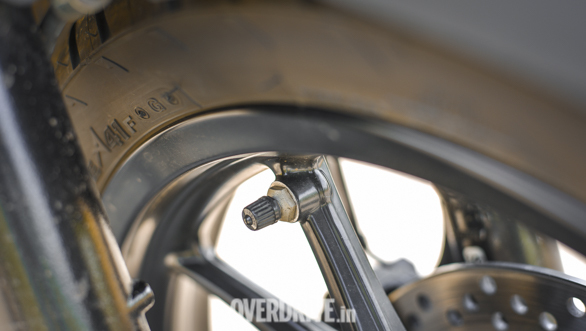 What's more, the F 750 GS uses cast alloy wheels and a unique feature here is that the air valves are seated on the spokes, rather than the rim itself. I always like to have fun with my motorcycles and while adventure tourers do not fit the bill exactly, the 750 is an exception. It handles brilliantly on the road and feels very nimble, be it slicing through traffic or devouring corner after corner in the hills. Throw it into a fast bend and the bike impresses with its stability and never has a problem being flicked from side to side in chicanes either. Braking is impressive too  dual 305mm discs offer ample retardation, in a safe, surefooted manner. The Pro version also comes with an electronically adjustable rear monoshock. Preload and damping are altered depending on the riding mode and the suspension raising or lowering the bike every time I changed modes was an experience! The front forks though conventional do their job well and offer an agility I wasn't really expecting, while also damping out undulations well. 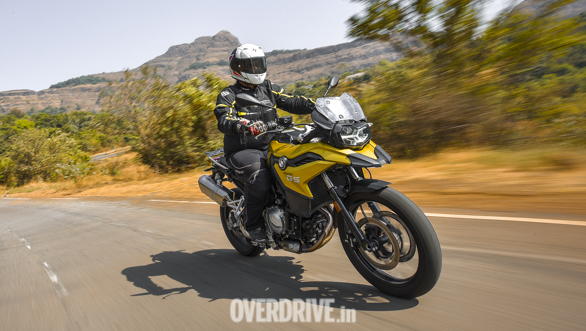 The handling reflects well in the bike's ability to let you cover distances in a flash too and it feels stable even at high speeds, even well above 130kmph. Wind blast is a bit of an issue given the short windscreen, but not a glaring one. Comfort levels are good though I have to say the F 750 GS is an eager-beaver that will make you want to ride it hard even on long rides, which eventually causes some fatigue. 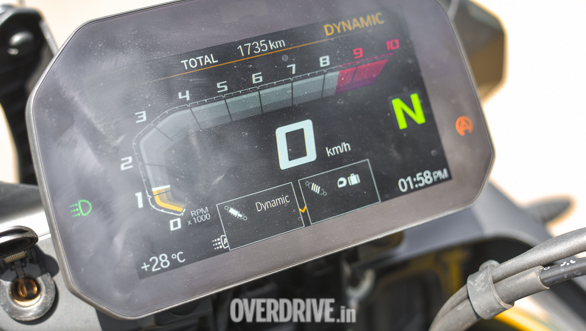 The Pro version comes equipped with some cool bits like an optional 6.5 inch TFT display for the instrument cluster which is a near Rs 60,000 addition. It looks crisp and is very bright, so visibility even in harsh sunlight isn't a problem. You can also connect your smartphone and get notifications or use navigation. The Pro also gets an iDrive like rotary controller on the left handlebar similar to BMW's cars and allows you to scroll through menu options on the go, but isn't very intuitive. 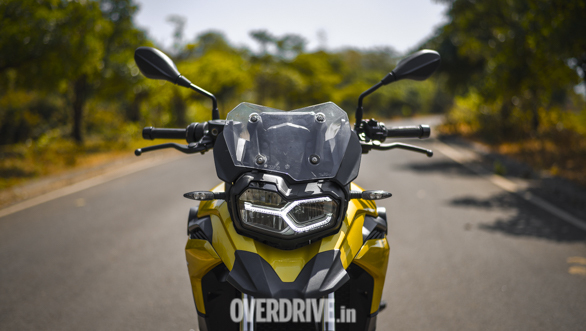 The Pro also gets Dynamic and Enduro modes in addition to Rain and Road, both of which are standard on the 750. Dynamic of course is where all the fun is, with the suspension getting taut and the ECU putting the power down aggressively. The F 750 GS shows an uncharacteristic urgency which and feels more like a streetbike on stilts rather than adventure tourer. Build quality and fit-finish levels are top notch and the bike feels very premium in all respects. The standard version retails at Rs 11.95 lakh ex-showroom while the Pro version retails at Rs 13.40 lakh ex-showroom. Prices are on the higher side in typical BMW fashion, but you really get a lot of equipment for the extra money you pay for the Pro. The F 750 GS thus makes a strong case if you like riding your adventure tourer to work every day. Not to forget, the 750 comes with the famous BMW roundel that brings with it a legacy and premium feel unlike few others in its segment.